Karnataka went to polls early on May 12 with 4.94 crore voters exercising their franchise to decide the fates of over 2500 candidates, contesting from 222 assembly seats. 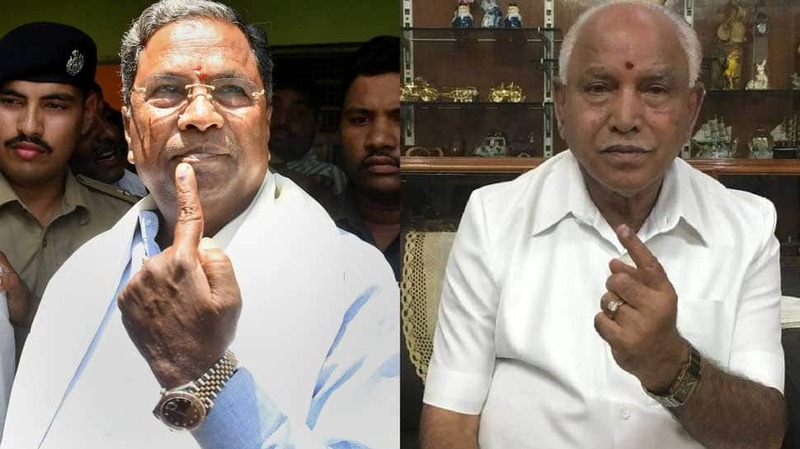 BENGALURU: The results of 2018 Karnataka Assembly elections will be declared on Tuesday. Karnataka went to polls early on May 12 with 4.94 crore voters exercising their franchise to decide the fates of over 2500 candidates, contesting from 222 assembly seats. The overall voter turnout recorded was 72.13 per cent. While the Opposition BJP is eyeing to dethrone the ruling Congress government in the state, the Siddaramaiah-led grand old party is confident about regaining power for a second consecutive term. The 2018 Karnataka elections exit polls conducted by different channels showed that the state is readying for a hung assembly. While some polls showed Congress as the single largest party, others claimed that the BJP will win the largest number of seats. JD-S will remain at the third spot, according to most exit polls. The 224-member Assembly expires on May 28 in the state where the Congress is currently in power, with 122 seats against the BJP's 43. Karnataka is one of the eight states where polls were scheduled this year. Now it is to see if the Congress can restore power or the Narendra Modi-powered BJP will foil its plan and make a comeback with BS Yeddyurappa at the helm in Karnataka. Congress emerged as the single largest party in the elections winning 122 seats, nine more than the majority mark. Siddaramaiah became the Chief Minister, with Congress forming the government after nine long years. The polls were held on May 5, 2013. Congress leaders Ghulam Nabi Azad and Ashok Gehlot arrive in Bengaluru ahead of the counting of votes for Karnataka polls. Karnataka has an electorate of over 4.97 crore, including 2.52 crore men and 2.45 crore women. There were 15.42 lakh new voters, all in the age group of 18-19. A single-phase polling was held in 222 constituencies out of the 224 elected seats in the Assembly, including 36 reserved for the Scheduled Castes (SC) and 15 for the Scheduled Tribes (ST). The election for the Jayanagara seat in Bengaluru was countermanded following the death of BJP candidate and sitting MLA B N Vijaykumar on May 4. The Election Commission has deferred the polls for the Rajarajeswari Nagar seat to May 28 after a massive row erupted over a large number of voter ID cards being found in a Bengaluru apartment. Why everyone want 'Modi' in Varanasi?